Shawna Renee Pealo and Edward Tiffin Cook III were married November 3, 2018 at 5 o'clock in the afternoon. The ceremony and reception were held at The Cedar Room in Charleston SC with the father of the groom, Ed Cook, officiating. The bride is the daughter of Ms. Deborah Serow of Fairport NY and Mr. John Pealo Jr. of Rochester NY and granddaughter of Mrs. Marlene Serow of Fairport NY and the late Mr. William Serow and Mrs. Jean Pealo and the late John Pealo Sr of Rochester NY. Shawna is a graduate of Fairport High School and attended Arizona State University. The groom is the son of Mr. and Mrs. Edward T Cook, Jr. of Charlotte NC and the grandson of the late Mr. Alexander Boyd Andrews and the late Mrs. Helen Burwell Styron of Raleigh NC and the late Mr. and Mrs. Edward Tiffin Cook of Wilmington Delaware. Eddie is a graduate of Hargrave Military Academy and the University of North Carolina at Charlotte. Maid of honor was Kaylee Hendrickson of Charlotte NC. 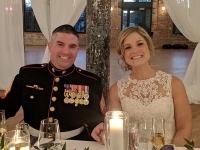 Also attending were Lindsay Scheer of Tacoma WA, Andrea Harter of Hilton NY, Alex Francis of Scottsdale AZ and Brianna Cook of Denver CO.
Chad Beheler of Roanoke VA served as best man. Groomsmen were Drew Cook of Denver CO, Will Cook of Cary NC, Scott Willis of Charlotte NC, and Josh Fullmer, Robbie Helms and Scott Bailey of Roanoke VA. Flower girls were Greer and Campbell Cook of Denver CO and Emilia and Maggie-Rose Freund of Ramsey NJ. Ring bearer was Brixton Freund of Ramsey NJ. The altar and cross as well as the reception table décor were hand crafted by the bride's mother, Debbie Serow. Ceremony music was provided by Palmetto Strings. The wedding was directed by Dina Berg Blazek Events of Charlotte NC and the photography was provided by Rachel Red photography of Charleston SC. The couple reside in Scottsdale AZ and will honeymoon in Italy in the spring.